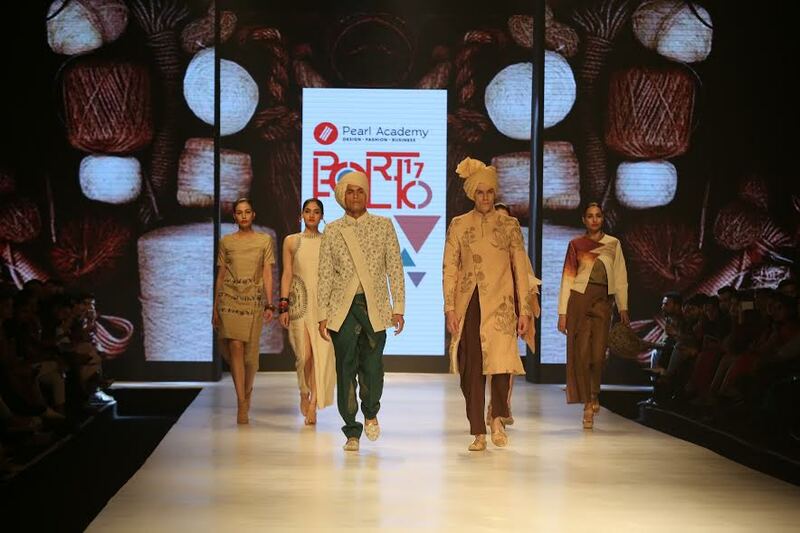 New Delhi: Pearl Academy, India’s leading institution in design, fashion, creative businesses and media communication showcased the work of more than 350 budding designers from its School of fashion, Styling and Textiles. This is the first ever occasion where 350 students from a design college have showcased their work at this renowned industry platform. The collections stood out with their innovative and ingenious ideas and subjects. ‘6 Dots’ – a collection prepared specially for the visually impaired with braille tags, ‘Raunaq’ – a collection made entirely out of katrans collected from neighborhood tailors were some innovative collections which the young, talented designers from Delhi, Jaipur and Mumbai campuses, showcased on the ramp. ‘Pearl Portfolio’, has been a signature event of Pearl Academy for more than 20 years and has been an annual launch pad showcasing the work of graduating students. The School of Fashion and Styling also put up an exhibition of their projects which drew a lot of appreciation owing to their unique themes and issues such as the ecological footprint created by the fashion industry, DIY hand knit toys to create bonding between fathers and kids etc. The finale saw attendance from Mr SP Goel, Joint Secretary, Ministry of HRD, Government of India, Mr Roopak Vasishtha, CEO & Director General at Skills Council for Apparel – Apparel Made –Ups & Home Furnishing Sector, Skill Council, Mr Abhishek Singh, District Magistrate, New Delhi and renowned designers such as Rahul Mishra, Liz Paul and Anju Modi among others. Applauding their efforts and encouraging young designers, Sunil Sethi, President, FDCI said, “I am highly impressed with the collections that have been put together by the students and I think they are ready to join the industry already. This is a great opportunity that these students have got and I am sure it will go a long way in instilling confidence in them. It is important for the fashion industry to raise capable successors and I have full faith that these students will set new benchmarks in the industry. Their energy has been infectious and I hope Pearl Academy will continue to produce such fabulous professionals for our industry”. “It is fabulous feeling for our students to be presenting their collections at the prestigious Amazon India Fashion Week. Our collaboration with FDCI has given superlative industry exposure to our students in the form of Master classes taken by renowned designers of India at our campuses. All this combined with the hard work of our students has led to this day where our students are sharing this platform with big names in the Fashion Industry”, said Professor Nandita Abraham, CEO, Pearl Academy. “This is the first time that students from a college are getting such an opportunity and I am sure that the great work of our students will shine through so that they get this opportunity every year”, she added.